Although I am not the full-time preacher for our home congregation, when I am not on the road conducting meetings, the elders ask me to preach. 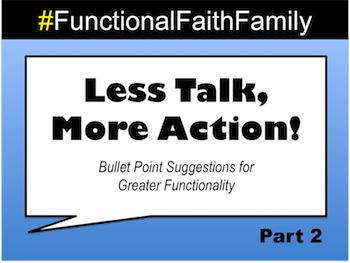 Recently, in between Sunday morning class and our collective worship service, I have begun running a slideshow of simple suggestions to help our church family grow in functionality. I call the slideshow "Functional Faith Family." Here are a few more of those suggestions. "Get All Warm and Fuzzy!" Everyone loves to get a "Warm Fuzzy." You know, those special little notes that sometimes come anonymously or are found unexpectedly. Build unity and goodwill within the church. Get all warm and fuzzy! Free time at work? Write a "warm fuzzy." Extra time after Sunday school class? Write "warm fuzzies." See an upcoming birthday in the church bulletin? Write a "warm fuzzy." Use your personal Bible study time to write a lesson on a favorite topic. Present it to the elders. If they agree, ask to present it or have someone else read it to the appropriate audience. After reading a text, ask yourself this question, "Who cares?" The answer to that question is the heart of your lesson. Have a friend read it back to you in order to hear how it would sound as a public reading. Present it to the elders for suggestions. Find a song and read one verse at a time. After each verse, ask yourself, "How does that apply to me?" Notice the names of those who wrote and arranged the words and music. Google their background. Try to imagine the context that inspired them to compose that message in song. Sing the song from the heart at least once each day. Few things create greater bonding than good food. Take time to study the importance of eating in the Bible. Take a meal or dessert to someone who has had surgery. Take a dessert to your neighbor and invite them to church. Invite someone from the church into your home for a meal. Volunteer to cook the entire meal for your church family. Church libraries often are a great source of Bible information. Unfortunately, they are seldom used. Make it your goal to visit the library and see if you can include any of the books in your daily Bible study time. Few things are more urgent or important than preparing ourselves to be functional and, therefore, a benefit to the family of believers. Back to Top of "Less Talk, More Action"